Doug’s Franklin Auto Care Center is your one-stop shop for any auto repair work. Located in Franklin, IN, we do reliable and dependent work in a timely manner. Customers come to us when they can’t find anyone else to fix it, so we do it all: brakes, transmissions, engine repair, oil changes, and more! Our prices are fair, and we will beat any written estimate. "I moved to Indiana today and I was having car trouble before I even reached my destination. I called around to several places..."
"I moved to Indiana today and I was having car trouble before I even reached my destination. I called around to several places and no one seemed to care. I came across Doug's Towing and immediately I felt the sincerity in Doug's voice. One of his kind employees came out to assist me. OFF THE CLOCK. I don't know where I'd be tonight if it wasn't for Doug and his partner. Amazing business and I will most definitely recommend to anyone. Thank you!" 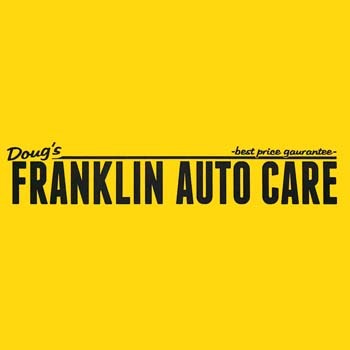 "dougs franklin auto care is the best! tip top is the tops"
"Got the job done first time, friendly people and I'll be back for sure"
"My husband and I take our cars to Doug alot. He is very good at what he does. Joe is also a very good mechanic. We are so lucky to have them. He gets the work done fast at a fair price." Established in 2010. Doug's Franklin Auto Care Center is proud to serve our local area which includes 30 Mile Radius from Franklin, IN, Johnson County, Franklin, Greenwood, Bargersville, Whiteland, and Edinburgh. We specialize in Over 30 Years of Experience since 2010.